1. Talk about wanting peace, humanity, justice and equality for everyone, Jews and Palestinians alike, as much as possible. Insist that the best way to achieve this is a one-state solution. If you do that, you don’t need to bother with the pretence that you have anything other than maximalist objectives that would see all of Israel being swallowed up in Palestine, that the “occupation” refers to anything other than all of Israel and that the solution to this conflict is a sovereign Palestinian state in the West Bank. If anyone expresses concern that you are calling for the disestablishment of one nation state in the entire world, which just happens to be the one Jewish state, turn it back on them and make them sound really unreasonable. To wit: “I believe in a one-state solution with equal rights for everyone, don’t you believe in peace and equality for all too?” If told that Israel is already a state with equal rights for Arabs and Jews, deny deny deny! 2. Do not under any circumstances talk about the Palestinians wanting self-determination, because that will alert people to the fact that the one-state solution would see the Jewish people losing their right to self-determination and being governed by Arabs, and is not actually about peace, justice and equality at all. If someone asks what Muslim majority or Arab state could serve as a model for a binational state, with Jewish citizens, let alone Jewish citizens with equal rights, say that this is irrelevant as we are not talking about other states. If pressed, acknowledge that it is hard to think of such a model state because Jews chose to leave Arab and Muslim states. This is true in the same way that some Jews chose to leave Nazi Germany in the early 1930s. 3. If someone tries to say that a two-state solution ensures equality and self-determination for both Jews and Palestinians, by giving them each self-determination, state that the time has passed for a two-state solution. The two-state solution is so last decade. Never, ever, admit that the time has passed because Palestinians have passed up every opportunity to have a state. But if you can’t deny it any longer, state that these offers were turned down because of “technicalities”. Do not acknowledge that one such technicality was the demand for recognition of Israel’s right to exist. 4. Make sure you have all the right gear. Nothing says “winner” like accessorising with Palestinian flags on your earrings, scarf and t-shirt. 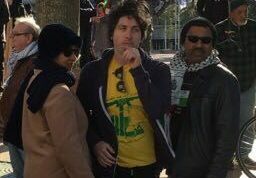 Nothing says peace, justice and humanity like a Hezbollah t-shirt. 5. When presented with inconvenient facts to which you have no answer and which reveal your ignorance, or which do not serve your narrative, you have a vast arsenal at your disposal. Walk away, pretend you didn’t hear, blame it on Israel, say it’s not relevant, claim it is Zionist propaganda, or resort to conspiracy theories. For example, if asked about how the stipends paid to Palestinian terrorists and their families by the Palestinian Authority, or incitement to violence, promote peace and humanity for all, claim that the fact of such payments and incitement are Zionist propaganda. If you are handing out the “disappearing” Palestinian land map, and are advised that the map is grossly misleading and that most of the land designated as Palestinian land in 1947 was not Palestinian land at all, state that “you have your propaganda and I have mine”. If told that MSNBC has withdrawn this map and apologised for using it, and that it is widely discredited, blame it on AIPAC (because obviously Zionists control the media). Also, claim that Arab governments are client states of Israel. If someone calls you out on this and points out that the evidence is a bit scant, given those governments’ hostility towards Israel, and that this does not seem to be working for Israel as a strategy, walk off. 6. Tell those who identify as Jews at the rally, who has and doesn’t have the authority to speak for them. Also explain to them what the relationship is between Zionism and Judaism and what the Torah says about Israel. You are better placed to determine these things than they are. 7. Remember all people can be divided into three discrete categories – the oppressed, the oppressor, and the champion of the oppressed. Make sure that you identify the category to which you and everyone else there belongs. 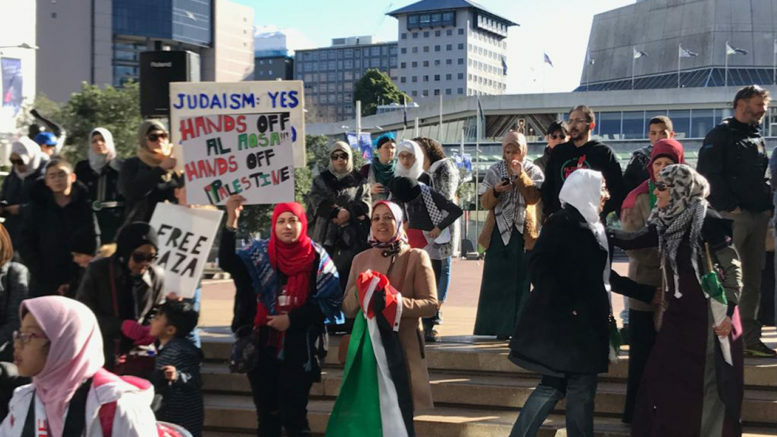 Remind people that the Palestinians are the most oppressed people in the world, and, when pointing out the Israel-supporters in the crowd, that Zionists are evil oppressors. Admonish the Zionists in the audience to look into their hearts to find humanity. Do not under any circumstances admit that Zionists are anything less than evil and inhumane or that Palestinians have any agency, responsibility or culpability. Avoid a discussion of the billions of dollars of Palestinian aid money that has been spent on terrorists (see #5), on building tunnels, and buying rockets in Gaza, or anything to do with terrorism at all. Make sure to note that the Holocaust was a terrible tragedy that befell the Jews, to establish your credentials as a champion of the oppressed and as a person of humanity who does not hate Jews. But then invert this, implying or claiming that Zionists are doing the same to the Palestinians. 8. Give a platform to a pet anti-Israel “champion of the oppressed” Jew, to provide a shield for all accusations of anti-Semitism. Also say repeatedly that some of your best friends are Jews. Refer to “as a Jew” writers like Anthony Loewenstein and Norman Finklestein to establish your bona fides as an open-minded intellectual who reads from a wide variety of sources and holds a well-informed opinion. Quote anything from Haaretz to show that you regularly read Israeli newspapers to get balance and/or highlight how much Israelis despise their government’s actions. 9. Further prove that you are a well-informed deep thinker willing to engage in a constructive dialogue by chanting catchy slogans with emotive hyperbole. Note that “apartheid”, “genocide” and “resistance is justified” conveniently rhyme. 10. Invite people to engage, but do not actually fall into the trap of engaging. Engagement is on a par with that other war crime, installation of metal detectors. Engagement distracts you from chanting and may require you to substantiate your mantras. Offer a debate but then set the pre-conditions that the other side must be against the occupation and anti-Zionist, hoping that no one notices that that means that it is not actually a debate at all. This tactic for setting unreasonable pre-conditions and then blaming the other side for not accepting them has been well honed (refer #3).